Heat grill to high (450° to 550°). Reserve 4 basil leaves. Whirl mayonnaise, remaining basil, garlic, vinegar, salt, and pepper in a food processor until smooth. Sandwich chicken breasts between 2 pieces of plastic wrap and pound with a mallet until 1/4 in. thick. Grill chicken, basting each side with some of mayo mixture and turning as needed, until cooked through and well browned, about 8 minutes. Brush one side of bread with a little mayo mixture; grill bread on both sides. Lay chicken on mayo side of bread. 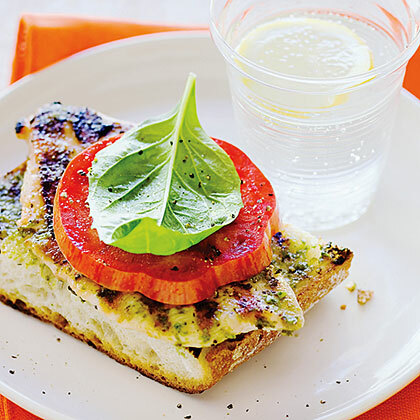 Top each sandwich with a tomato slice and a basil leaf and serve the remaining mayo on the side. Note: Nutritional analysis is per sandwich without extra mayo.